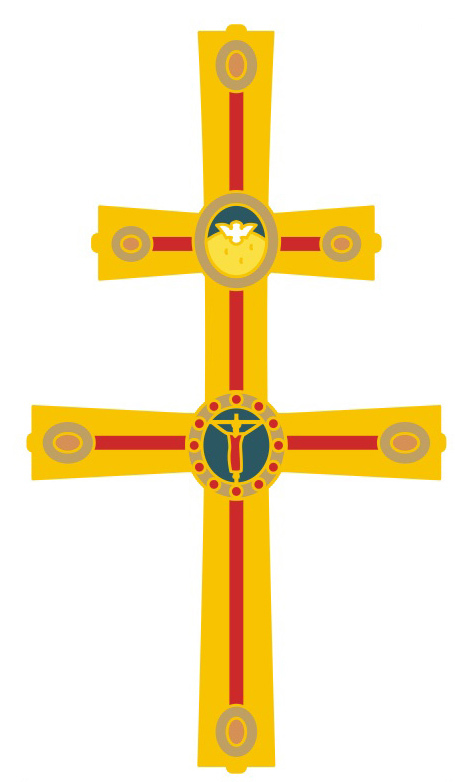 The Jubilaeum pin is a design taken from the archepiscopal cross used at St. Mary Cathedral. The cross is two-barred to signify the dignity of the archbishop. Made like a staff it has the two-barred cross up top and a long downwards extending arm. Created for the first archbishop, Coleman F. Carroll in 1968, when the Archdiocese of Miami was established, it is gold plated and features colored glass stones and two roundels at each barred cross. The top roundel renders the dove of the Holy Spirit and the bottom roundel the crucified Jesus, both in cloisonné enamel. The style is classic 12th century middle European design. The award pin is a sign of the unity the honoree shares with the archbishop and in thanksgiving for service to the archdiocese. MIAMI | In honor of its 60th anniversary, the Archdiocese of Miami has recognized more than 200 parishioners for their work in their churches. Archbishop Thomas Wenski will give them each a Jubilaeum Pin during solemn vespers tonight at St. Mary Cathedral. Oct. 7, 2018 is the anniversary of the establishment of the Archdiocese of Miami. Each pastor in the archdiocese had been asked to submit the names of two parishioners, not employed by the parish or the archdiocese, who they deemed to be a representative of a missionary disciple by the witness of their lives and their participation in the life of the parish. In total, 210 parishioners from Miami-Dade, Broward and Monroe counties were honored. The design of the Jubilaeum Pin is taken from the archepiscopal cross used at St. Mary Cathedral. The pin is a sign of the unity the honorees share with the archbishop and in thanksgiving for their service to the archdiocese. In addition, 10 parishioners also received Primum Regnum Dei award, the highest honor given by the archdiocese. Primum Regnum Dei -- first the Kingdom of God -- was the motto of Miami's first archbishop, Coleman Carroll. Following is the list of recipients of the 60th anniversary Jubilaeum Pin and the Primum Regnum Dei award.